One thing that sets Dr. Kerry Solomon apart from other ophthalmologists in the Charleston, SC, area is his dedication to truly customized vision correction. Although he is well established as the LASIK and cataract surgery leader in South Carolina, he does not promote these procedures unless they are the ideal solution for the patient. By offering a full range of state-of-the-art options, he is able to recommend the vision solution that is truly best for the patient based on age, vision concerns, and other physical and lifestyle factors. If you would like to learn more about your options for vision correction, request an appointment using our online form or call our office at (843) 881-3937. One of our friendly, knowledgeable staff members will schedule an appointment at a location and time that is convenient for you. Poor distance vision can be caused by nearsightedness (myopia) or farsightedness (hyperopia). These conditions occur when the curvature of the cornea either is too steep or too flat, which prevents light from focusing directly on the retina and causes blurred vision. The term astigmatism describes a common problem that occurs when the cornea is not evenly curved. Normally, the cornea’s surface has a spherical curve (like the shape of a basketball) and the light rays passing through it focus on one spot. Sometimes, however, the curve is uneven and more closely resembles the shape of a football. This causes light to focus on more than one spot. As a result, vision is blurred. The traditional term for poor near or reading vision is presbyopia. Presbyopia is an age-related condition in which it becomes difficult to focus on objects up close. This natural process, which typically begins around age 40, occurs as the lens and the muscle fibers surrounding it lose flexibility with age. Patients of Dr. Kerry Solomon can often choose to have their presbyopia corrected with a monovision procedure, in which one eye is corrected for near vision and the other for distance. 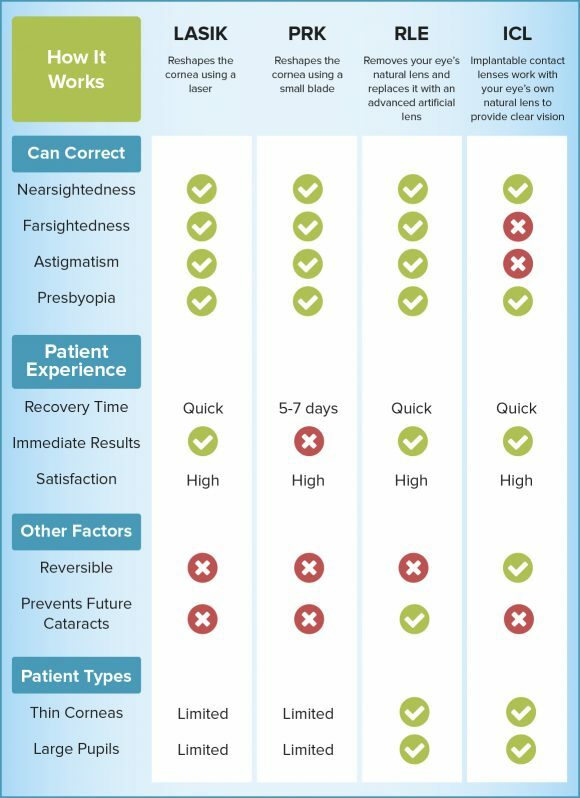 In addition, many cataract and RLE patients have the option of choosing multifocal lenses that correct both near and distance vision. Monovision is a solution for presbyopia in which vision in one eye is corrected (through lenses or refractive surgery) for distance, and the other is corrected for seeing up close. The eye with good distance vision will be slightly blurry up close, and the eye with good close vision will be slightly blurry at a distance, but when using both eyes, most people will experience acceptable vision at a variety of distances.